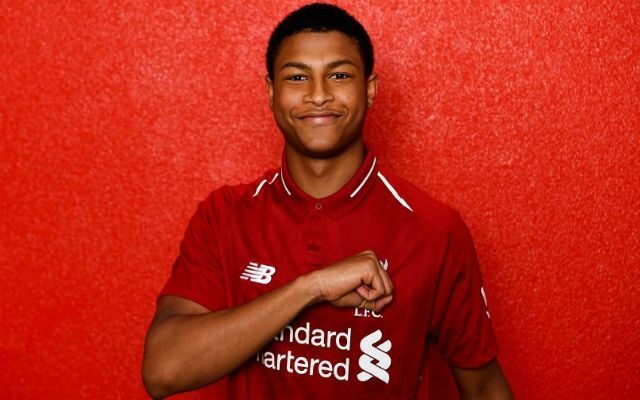 We can’t wait for Rhian Brewster to make his comeback from injury and make the step up to Jürgen Klopp’s first-team. The 18-year-old striker has spent the past 14 months off the pitch after sustaining ligament damage in his ankle and knee during an under-23s game against Manchester City. The young Englishman has been recovering on the sidelines demonstrating exceptional maturity during his rehabilitation. Off the pitch, Brewster has given a tell-all interview with Neil Jones at Goal about his forced absence from football. The young Liverpool striker wrecked his ligaments and was lucky that he didn’tbreak his ankle. After complicated medical assessments and multiple operations the initial prognosis of four to five months was woefully prolonged. Over a year out of training, Brewster’s recovery has been long and onerous, “You find out a lot about yourself,”he told Goal. “You have to be tough mentally.” Long days at Melwood took a toll on his mind as well as his body. “The operations were big ones, so I knew it’d take a lot of hard work. It’s hard, you know? You’re in the gym for hours on end doing strengthening exercises, and that’s just so you are able to start running again. But the young forward has now returned to training and is hoping to follow in the steps of his fellow absentee, Alex Oxlade-Chamberlain, by getting some minutes for the under-23s before the end of this season. That’s a testament to the 18-year-old’s attitude, as well as our determination to keep him at the club. Despite overtures from Bundesliga clubs, Jürgen Klopp made a point of name checking Brewster in press conferences and inviting him to continue his recovery with the senior squad. “It’s huge for me. They still wanted me even when I was out for months, and for a player that’s a big thing. We can’t wait to see you either, lad! Next season could be a massive turning point for the young striker at Liverpool. It doesn’t look like Daniel Sturridge will be offered a new contract potentially paving the way for Brewster to finally make his mark with us.